Most of the Sachin Dev Burman scores I have are from the 1960s and 70s. Considering his career dates as far back as the 1930s, chances are I've missed a prior trick or two; the price I pay for being (too?) focused on the Western-influenced funk & beat stuff I suppose. 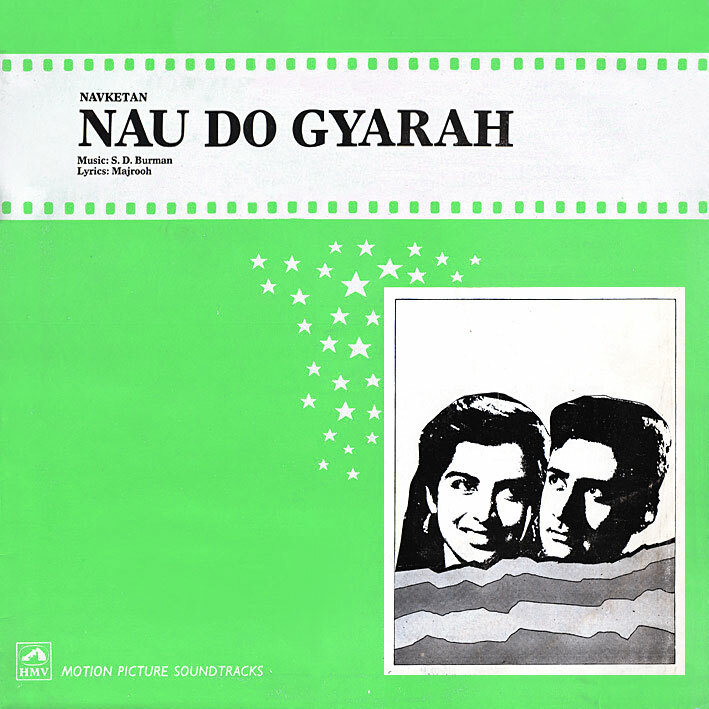 With that in mind, I'm glad I came across 'Nau Do Gyarah', one of those charmingly old-fashioned musical tonics I require (and have posted) on occasion. Full of great melodies; 'Kya Ho Phir Jo Din Rangeela Ho' and 'Aankhon Mein Kya Jee' would be my favourites were I forced to choose, but I don't really want to considering how much joyous fun the soundtrack brings about as a whole. Thank you! These old soundtracks are fabulous! Great soundtrack PC." Teen Devian" is another S.D classic. I've not come across that one. Intriguing title I must say. All available in youtube, listen before buying. I love your blog and I became a member. I also look towards new members on my blog: Oro, where you are welcom. Thanks for this great blog! I used to listen a lot to your tapes! I’ve been doing chronological maps with music from the world. Each map covers 5 years, and you can listen to a song chosen for each country or city. I know very little about music from India so if you could give me some advices about important songs or artists, to fullfill the maps, it would be much appreciate! hi bro its bobby-long time no news from u?? Yes I suppose it has been a bit silent here of late. More Bollywood activity to follow shortly though. @boebis I don't really know much about Indian music other than the soundtrack stuff covered on this blog I'm afraid, sorry.